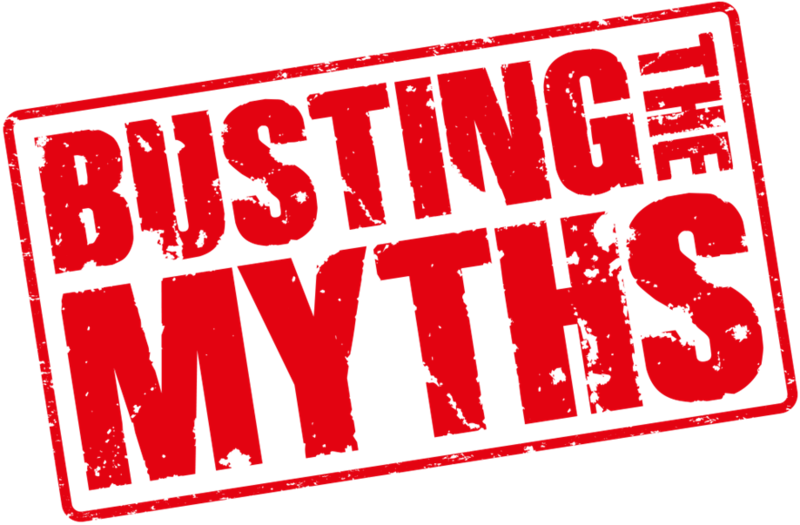 It is time to bust some myths about bank funding. Some of them come out of our comment stream, one from the banks themselves. The data is openly available for all registered banks from the RBNZ website on series S6. All the detail here is for the banking industry as a whole, not necessarily for any one bank. Myth 1. "Banks get minuscule funding from households"
This is a common myth. If is far from true. Banks get about half their NZ dollar funding from bank accounts/deposits from households. Further, this source of funding is growing, not declining. Ten years ago, (January 2007 and pre GFC) banks got 35.2% of their NZ dollar funding from households. In January 2017 that had risen to 46.8%, touching the record high of 46.9% in September 2016. Of course, NZ dollar funding is only a part of banks' total funding. But it is a growing part. Ten years ago 62% of bank funding was sourced domestically. But by January 2017 that had grown to 72%. So that busts another myth. There are four other minor categories not shown in this chart. Myth 2. "NZ banks are mainly reliant on offshore funding"
Sure, in 10 years, our banks have borrowed $25 bln more overseas. But they have also sourced a massive $151 bln more locally. That shift has allowed our banking system's exposure to foreign creditors to fall significantly. More to do? yes. But it is going in the right direction. If you are still critical of how much we rely on offshore debt for our banking system to function, you need to suggest a 'safe' level. Myth #3. "Banks are taking advantage of us"
Actually, the evidence is that it is an own goal. We as customers don't manage our deposits well. We leave far, far to much in accounts not accruing interest, or in too-short term accounts bearing very low interest. It is hard to believe perhaps, but more than 80% of bank funding is in accounts that mature in less than 12 months. A closer look at the detail shows that 37% is held at call, and another 21% is due in 90 days or less, and another 13% is due 3-6 months. New Zealanders think very short term when it comes to their own finances. And we have done so for a very long time. It was over 80% ten years ago too. They know what their 'replicating portfolio' of lazy money is, and are taking advantage of it. Change will only come if customers change their money-management habits. Myth #4. "Bank margins are under pressure because interest rates are rising"
To be fair to banks, they don't say it exactly like this. They talk more generally about "margins under pressure", and they are*. But it is not because of rising interest rates, nor because credit spreads are rising. In the US wholesale markets, there were some changes in 2016 that affected the availability of offshore funding and the rate. But that hasn't affected bank fund raising much at all. And as we saw above, most of their funding is domestic. The same RBNZ series that reveals the funding maturity also reveals the "weight average interest rate" on this funding. The bald fact is, the January 2017 average rate of 2.43% is a record low since when this series started twelve years ago. The record is likely to be much longer than that, as this graph suggests. * = Margins are under pressure because the volume of transactions is no longer growing. It is a dollar shrinkage of margin, not a rate shrinkage. I made another chart when researching this story. It is interesting all the same even though not strictly relevant here. Interesting indeed .... thank you for this insight. Which begs the question why are mortgage rates high as they are? Has local funds dried up/constrained? My bank is being disingenuous and taking advantage of me? *GASP*!!!! you say kiwis think short term about deposits or is it a practice that has formed after the GFC and finance companies collapsed, also the OBR also plays a role as does savers interest rates. I'm sure if there was banking insurance you would see a difference. The cause of reduce deposit creation is individual banks who, in their failure to offer adequate terms to attract local depositors instead choose to borrow for funding. That borrowing puts the system into deposit shortfall. It is nothing to do with "local funds drying up" or depositors putting their money "elsewhere" there is no elsewhere except under the mattress. Peri - what's with the term "borrowing" ? They borrow for funding from whoever they get their money from whether its local investors/savers, wholesale onshore or offshore funding - are you inferring that they prefer to pay up for funds elsewhere rather than raising local deposit rates more ? If you are, theyre surely the only businesses in the world that do, makes you wonder how theyre survived so many centuries? David, My understanding from prior comments made, was that banks charge much higher mortgage rates in NZ because they are forced to service their own borrowing in foreign currencies. However, you are saying here that in 2017 banks get 72% from local funding. Does that mean the remaining 28% is where the extra costs are coming from? Congratulations, this discovered the obvious. At the top of the page is an advertisement offering 3.8% for a 9 month term deposit - 2% over the OCR. That tells most of the story.Banks would be delighted if they could raise more on shore, but 1. wanting it doesn't make it available. There is only a finite amount of money held on deposit. 2. Depositors don't want to tie up money for too long but banks are required to hold both local deposits and longer term funding by the RBNZ. .If more money was saved than borrowed, banks would not have to price at these high levels to get deposits in. There isn't much more to it than that. Thanks for the mythbusting DC. Very informative. I manage cash carefully but still the businessness runs best at about $40k in credit. So the bank has $40K free funding. Mind you it has to be regarded as short term funding. Glad to see someone finally do a post on this, I appreciate the time gone into it and have found it provided some interesting background. But I honestly don't believe you have busted a single myth. In fact I would go so far as to say you have only re-enforced them. Reason being: If the OCR has consistently dropped over the past few years, and does not look like it is rising for at least a year (if not more). Would you not expect floating/short term rates to drop? yet they are not, in fact they are rising! So the question is, are you lying about the funding? or are the banks? The reality is, it doesn't matter. - Offshore funding is cheap as chips (cheaper in fact) so if they are using offshore funding they are rorting us. - Onshore funding is as cheap as chips too - as you say, most kiwis have short term deposits in low and even zero interest bearing accounts. So again, it appears we are being rorted. So regardless of where they are getting their funding, they are making a killing at our expense, and if you read their annual reports, it would appear the banks agree. I take offence to this one the most. There are numerous reasons why people keep cash in low interest accounts (may I add they are only low because the banks wont raise the rates). 2 - Trust - No deposit guarantee, why not? every other bank in the world does it. OBR is not exactly a customer friendly piece of legislation if you are a depositor. 3 - Liquidity - No point locking up a house deposit in a 1+ year fixed term. Pretty hard to buy that dream house (or crudhole if you live in Auckland) when the bank wont give your cash back. 4 - Cash flow - people don't necessarily have large lump sums lying around, they have a sum that they wish to add to each pay. Try tacking on $100 a week to your 5 year term deposit, or try setting up some ongoing TDs for the kids education when you can only contribute $50 a week. 5 - fees and break fees - lock your money up and prepare to pay to get it out. 6 - low rates - There are better investments pretty much everywhere - Shares, property, Lotto, TAB, even under the mattress where OBR can't touch it. 7 - They just don't have savings. Look at the consumer debt our country has - we aren't exactly flush with cash. Now the biggest issue I have comes from this statement "Change will only come if customers change their money-management habits." We have changed our habits - We want more control of OUR money. The banks simply wont play ball though, they don't want us to control our money, as they (and for some stupid reason the Law) see it as their money. Which they then want to maximise the profit on. Now a quick logic test - If two people (consumers and banks) are trying to maximise their profit on a given dollar, by borrowing and lending money to each other - then there are only three possible outcomes. Now the Banks annual profit statements show that they aren't breaking even, and they aren't losing, so I can only assume that it is us, the consumers who are losing. Bank margins are clearly not under pressure. They are making larger (often "record") profits year after year. Since 2009 funding rates have been below 4%, they are now they are a "record low" of 2.43% and seem to be trending down. Logically this would be expected from consistently low global rates for the past few years...Yet shock horror, the mortgage rates are increasing? Now I know capitalism has to have a winner (and therefore a loser) and I am fine with that. But it doesn't have to be an out and out thrashing. So I put it to everyone again, can anybody explain why are our rates going up? or are we just being fleeced? What isn't revealed is important. At what rate to banks anticipate defaults? What are they expecting given the state of their mortgage book? How many late or non-payments are going on right now? How many houses are being sold because the banks have told them to? The banks won't tell us this information but it makes a big difference to funding and cash flow. Very true - it would be fair to argue that if we (the Banks local customers) are not aware of this, then we are indeed being taken advantage of. Noncents, banks are no different than any other business when it comes to supply and demand. If they are in a position where they are experiencing heavy demand for funds v lower supply of said funds, they will increase their prices (interest rates). While they are trading in these kinds of conditions the OCR has less influence on their rate setting decisions. Maybe, but there does not seem to be a shortage of funds out there, otherwise we would see them turning away more applicants. It is worth mentioning the growth in M3 (broad money supply )...., as a funding source. Over the last yr this grew by about $20 billion..
Any growth in money supply requires the "creation" of new money... ( normally from credit growth ). Will Mr Chaston bust your contention and the sources listed below confirming your claim? In Jan 2007 M3 was $187 billion. In Jan 2017 M3 is $324 billion. What proportion of foreign currency funding is short term, and is it covered? about half of wholesale funding is less than 1 yr.
About 60% of wholesale funding is raised offshore. Let us say that myself and 399 other like minded people each have about $1,000 deposited in various low interest savings accounts. So the total available to the bank is about $400,000. For which they pay us about 1.5% interest per annum. Now along comes a nice young couple (we'll call them John and Jane) looking at buying a house in Auckland. The property they are after costs $1mil. They have scrimped and saved and managed to get the $200k deposit together. The bank sees them as a good solid mortgage, but still need $400k to lend so they borrow from offshore at 3%. The bank then lends a total sum of $800k to John and Jane at 5%. Now one year goes past. John and Jane have paid $40,000 in interest to the bank. The bank retains $22,000. Not bad considering they used no capital of their own. Now it is the second year, the forecast apocalypse has hit. People are out of work, house prices have collapsed. Jane has been at home looking after the new baby, on one income they have been a bit lapse in their payments and have actually redrawn all of the principal they paid off last year. Then John gets made redundant, they can no longer afford to pay the mortgage at all. The wider populace know if John and Jane can't get by, then no-one can. They make a run for the banks... the OBR is enacted. So, where does the money from the sale of the house go? John and Jane get nothing back, they are now homeless and down the $200k deposit they had saved. The offshore lenders are secured, so they get all their $400k back. That leaves the bank $100k to return to the local depositors. They get a measly 1/4 of their investment back, losing $750 each. John and Jane took a risk (although home ownership isn't generally perceived as such) and lost $200k. The local depositors thought they had taken minimal risk, yet lost $750, for a measly $15 in interest. - Why should a bank make a 3.5% return on money that is not theirs? - Why does the actual risk taker (the depositor) only make 1.5%? - Who is being ripped off? As Finance companies found out back in 2008 , borrowing short term and lending long term is very risky.. If depositors fail to reinvest their money and withdraw....then there is a Crisis. SO.... The Bank is the risk taker... BUT... retail demand deposit holders don't realize how precarious that borrowing/lending strategy is if deposit holders lose confidence. What saves us all is that the RBNZ would step in and provide "liquitity"... BUT ..if a Bank has too many bad debts then we would have an OBR events and the Govt would take it over..
"As Finance companies found out back in 2008 , borrowing short term and lending long term is very risky.. If depositors fail to reinvest their money and withdraw....then there is a Crisis." Surely if it is indeed riskier, then the long term mortgage rates would be higher than the short term (less risky) terms? I kinda used the term "risky" to make the point.. In reality the Banking system has the RBNZ to provide liquidity, so in a way Banks can play the game safely.... ie. RBNZ will bail them out. Banks do still need to be prudent.... and they do seem to be. History shows that borrowing short to lend long is inherently unstable. Thats right.... Normally the floating rate mortgage is the cheapest.. I'm guessing the Banks can borrow really cheap in the offshore wholesale mkts..
ie.. their cost of borrowing determines what rates they lend at..??? Lets face it, they are under no real legal obligation to return our money. So I guess being prudent is all relative. Good thread - I think even David would have enjoyed the responses to his myth theory. One thing is clear - the bank will always protect it's profit before the customer. Which means the customer has to be money savy and prepared to negotiate hard when taking out a mortgage or putting money in term deposits. Then I feel there is some mutual respect for one another albeit if you have the 20% deposit to do so! And yet, as a bank shareholder I receive dividends that are solid, but not spectacular. Certainly not in the 'creaming it' category. If the theoretical gross margins talked about are actually being achieved, capital adequacy reserve holding costs must be significantly eroding returns or else banks expenses are too high. I suggest that the market is pricing bank shares at multiples of book value, so shareholders only receive solid dividends relative to market cap, but receive high dividends relative to capital invested. Yes, you are correct. I left out the 'return on capital' bit. But do you still think the net shareholder return on capital is 'high', relative to risk ? Your observation is emphasised by the recent run up in Aussie bank share prices. Peri correctly reminds me that the price of a share is not a reliable indicator of return on capital or even the actual risk where investors fail to judge that. But in the end one either rides the roller coaster with its attendant risks, or watches from the ground. Wrong. If OBR is "enacted" then the shareholders in the bank lose EVERYTHING. So "the bank" (meaning current shareholders who own the bank) loses 100%. And then offshore lenders (for most offshore lending) rank EQUALLY with local people who have money sitting in their cheque account. Senior bonds rank equally with deposits in the event of a liquidation or OBR event. The only exception to this is "covered" bonds but banks can only issue a very small amount of these for exacfly the reason of protecting local depositors. Yep, as a share holder I understand and accept that risk. Doesn't alter my observation that the alternative to being in the market is dreadful returns, with OBR raising the risk profile should your alternative investment vehicle be bank deposits. Difference between 9 months vs 5 years is 3.7% vs 4.2 %, not much, and with interest rates trending up not much incentive to go long-term. Now if it was 3.7 vs 6% it might make a difference. I'm sorry David, but each of the four big banks taking a $1 billion in profits out of the country every year is not a tale of squeezed margins, but one of the consumer being shafted. I'm with Noncents (above) on this one. I just don't believe it! I have most of my money in shares and very little in the bank. Why? Because I don't trust the banks. With a little thought the return on the share-market is significantly more than any bank offers. Admittedly I have to do a little more work, but I have more flexibility too. But a lot of the problem is the bank's customers lazyness or failuer to manage their money more effectively. I am doing the same Murray86. The return is better on shares but the risk is greater. I do think though that while officially there is no deposit guarantee if a Bank went bust Government would recompense those depositors. Especially when they can print the money to do so. They would never be elected again if they did not. So many New Zealanders would be affected that there would be a run on all the other Banks by those that were not affected by a particular Bank's demise. I tend to agree. You may not get 100% of your money back, but to do nothing would be political suicide of a scale never seen before. Myth 5 BNZ Chief Economist gets away with crapping on BNZ's customers. I am with DC. I see that New Zealanders are lazy consumers. And lazy managers of businesses. We need to be more alert, care more, and seek to reduce what we pay, and demand service for what we pay for. Simply put we actually just coast along, and surprise, the banks use that. In all negotiations you require leverage of some sort to strike a favourable deal. The average kiwi doesn't have that leverage. As a depositor, does the bank care about my $1? $100? $1,000? $10,000? $100,000? the answer is no. It is chump change at their end - so I have no leverage. I have switched banks 6 times in 10 years for better rates/lower fees. The old banks don't care, and once you sign the new bank doesn't either. Maybe a coordinated bank run by the populace would send a stronger message. Perhaps the banks would get even more from depositors if there were a depositor guarantee scheme. The bank's recent surreptitious move for term depositors means that now their money can't even be accessed for specified periods, leaving aside any loss of interest. The reserve bank has rightly imposed stricter bank control but the banks simply pass the problem on to depositors who face low interest account safety, versus potential ruin in a run on banks. Just remember Cyprus, the only people voicing ruin were those with large deposits and no one else was bothered (the majority) . Hi there - just wondering where you found the information regarding the heading: Myth 1. "Banks get minuscule funding from households"